Annatto Seed for Pigmentation and Annatto Seed as a Seasoning. Annatto, also known as roucou, refers to the seed of a tree native to the East and West Indies that’s been used as seasoning and to produce a natural yellow to orange dye. 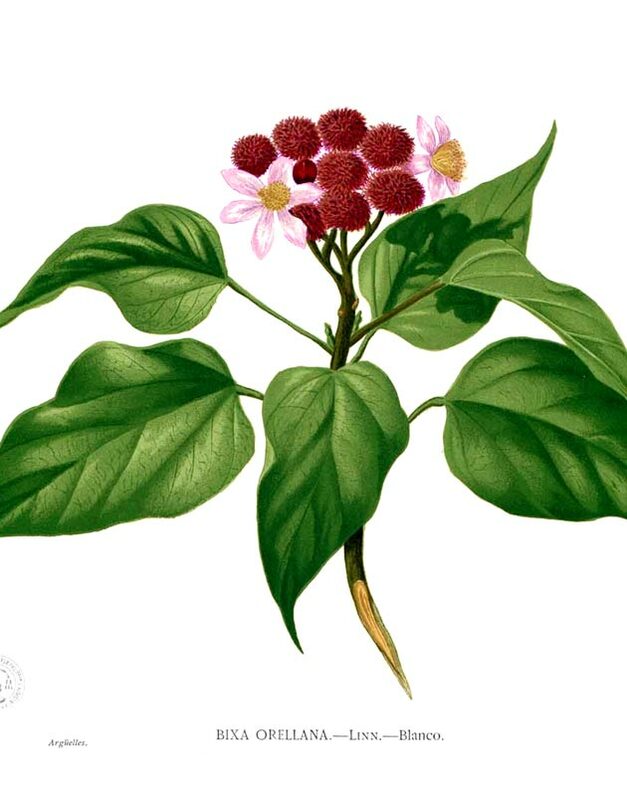 While the whole or crushed seed is used in cooking to add spicy-sweet flavor and a reddish color, the powdered herb is used as a coloring agent in various herbal arts, like soapmaking. Annatto, or Achiote, is the only member of the plant family Bixaceae, it grows as a tropical shrub or small tree. The fruits are heart-shaped, brown or reddish brown at maturity, and are covered with short stiff hairs. When fully mature, the fruits split open exposing the numerous seeds. Although it does not produce an edible fruit, the achiote is widely grown for the orange-red pulp that covers the seeds. The achiote dye, which is prepared by stirring the seeds in water, is used to color butter, cheese, rice and other foods. In the Philippine Islands the seeds are ground and used as a condiment. The name Achiote derives from the Nahuatl word for the shrub, āchiotl. Annatto originates from the tropical region of South America, it is cultivated there and in Southeast Asia, where it was introduced by the Spanish in the 17th century. The main annatto growers are Bolivia, Brazil, Colombia, Ecuador, India, Jamaica, Mexico, Peru, Puerto Rico and Dominican Republic. Annatto plants like to grow above 4.5 °C (40 °F) in full sun to partial shade in tropical conditions. Annatto prefers rich, well-drained soil, typically on the edges of forests. Annatto is commonly grown from woody stem cuttings or from seed; direct sow outdoors in fall. To harvest annatto, bag the seed heads to capture ripening seed, allow the seed heads to dry on the plants; remove and collect seeds once they are dried. Store seeds whole or ground in a cool, dry place. Individuals who are sensitive to artificial coloring may also have sensitivity to annatto, even though it is plant-based. Annatto seed (Bixa orellana L.) is obtained from the heart-shaped fruit of the achiote, a small flowering tree that is native to Central and South America. Often referred to as simply achiote, annatto fruit and seed are also known by a variety of other exotic names, including roucou, bija, kangaram, jarak belanda, and atsuete, to name but a few. 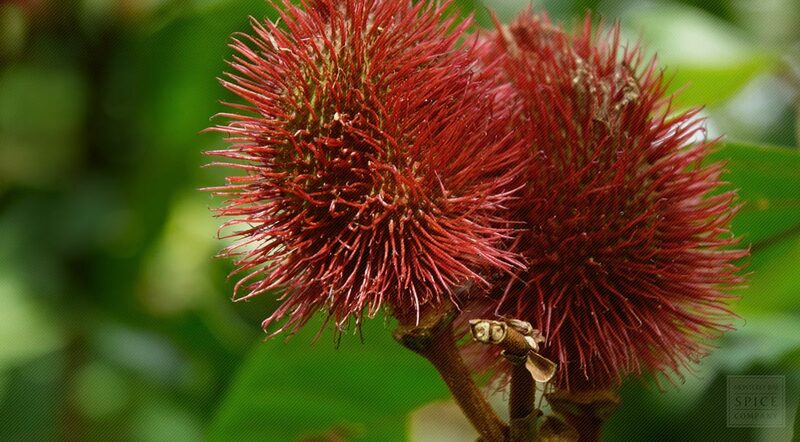 According to legend, annatto seed was first introduced to the Philippines by the Spanish conquistador Gonzalo Pizarro y Alonso upon returning from an expedition to Peru, where he assisted his older brother in conquering the Incan Empire in the mid-16th century. Distracted by false tales of cinnamon trees growing prolifically in the Amazon basin, Pizarro abandoned the booty pillaged from the Incas in pursuit of the spice, which was a highly profitable commodity at the time. Unfortunately for the conquistador and nearly 2,000 of his soldiers, the cinnamon trees remained elusive. However, the Peruvian natives apparently gifted the marauders with the deadly smallpox virus before they set out and most of them died in the Amazon jungle. As for Pizarro, who was forced to leave behind his ill-gotten plunder and the hope of finding cinnamon, he was rewarded with the discovery of a bounty of annatto berries instead as he made his escape down the Amazon river. Annatto seed contains pigments that contain up to 80% bixin, the fat-soluble portion of a particular type of carotenoid acid known as xanthophyll. The remaining percentage consists of water-soluble xanthophylls called norbixin. Both compounds are responsible for lending annatto, or the pulp surrounding the seed, it’s characteristic yellow-orange color. However, the more norbixin present, the more yellow the annatto. Likewise, a higher concentration of bixin generates an orange-red hue. The indigenous people of the region used annatto to produce a dye for many purposes, most notably for body paint to deter evil spirits as well as human enemies. Mexican artisans of the 16th century used annatto dye to embellish manuscripts and maps produced during the Spanish conquest. Whether the people knew it or not at the time, the dye also acts as a natural sunscreen. In fact, modern science has confirmed that certain peroxides found in annatto seed and pulp inhibits the mutation of DNA promoted by excessive exposure to ultraviolet light. Given this fact, it’s not by accident that annatto seed extract is included in many types of skin care products today. It is also used to tint lipstick, which is why the tree that bears the fruit is sometimes called the lipstick tree. Annatto seed is also a traditional ingredient to flavor and color many South American dishes. Achiote paste made from the ground seeds, vinegar, and a variety of herbs, is a popular addition to soups, stews, moles, and rice dishes. In the United States, annatto seed is classified as a food and color additive (E number E160b) and it is used to tint cheese, butter, and margarine. American consumers may also be familiar with the seasoning blend sold as Sazón, in which annatto seed is a primary ingredient. Generally, annatto seed is not known to produce allergic reactions. However, it should be noted that the commercial food coloring produced from the seed shell is the only natural food additive known to trigger many of the same allergic reactions that are associated with artificial preservatives and colorings. Therefore, individuals with a known sensitivity to red or yellow food colorings, as well as the preservatives BHT and BHA, should probably avoid annatto. Otherwise, those with an adventurous spirit and palate might try their hand at making recado, a traditional seasoning made from ground annatto seed, dried oregano, garlic, cumin, black pepper, allspice, Yucatecan chiles, and the juice of Seville oranges. This blend is excellent for marinating poultry, beef, or pork. This process can be expanded to include a method of cooking known as pibil, which involves wrapping the marinated meat in banana leaves and roasting it in an open fire pit (or an oven). The ground seed also makes an excellent addition to soups and stews, or can be infused in an oil to be used for frying foods. You might also try adding annatto seed to your next cup of hot chocolate, just as the ancient Aztecs to deepen its flavor and color.